So much has been written about Lotus of Siam (LoS) - just Google it and tons of hits will come up, dedicated to how delicious the food is and the best menu ordering strategy. There is even a 17 page slideshow on Serious Eats displaying the best dishes. Are you ready for my earth shattering opinion? I thought it was good, but not worthy of the "Best Thai restaurant in America" title that many have bestowed upon it. Perhaps my expectations were too high, and my dining arrangements were not optimal, but I really expected to be wowed. I came away from the meal thinking it was interesting and there were definitely tasty bites but it was nothing to rave about. I guess I should also mention that I was still sick, so who knows what flavor nuances I missed. LoS is known for their Northern Thai specialties, dishes that are normally not listed next the Pad Thai on your local restaurant's menu. I think the best way to experience LoS is with a group of 6 to 8 people, who are adventurous, open-minded eaters that are happy to share a plethora of dishes. That way everyone can try a large assortment of food. Somehow, I ended up in a group of 14 people, at a table half the length of the dining room, sharing with just Steve. 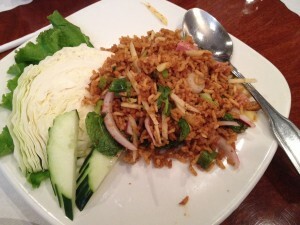 We started with the Nam Kao Tod ($9) appetizer. It is described as "Crispy rice mixed with minced sour pork sausages, green onions, fresh chilis, ginger, peanuts and lime juice." The rice had great crunchy texture, and there was a fascinating blend of flavors - spicy, meaty, and sour that was new to me, but I think I appreciated the dish more because it was novel as opposed to delicious. 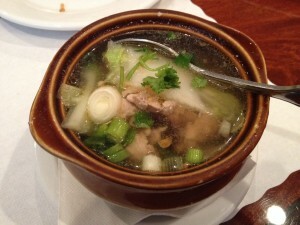 I had a bowl of Woon Sen soup ($4). This was just because I was sick and wanted something warm and soothing. It fit the bill; the simple chicken, mushroom and noodle soup was flavorful and the meat tender. 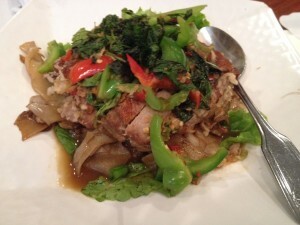 We shared the Crispy Duck ($26) on Drunken Noodles. The duck was inconsistent – there were some excellent bites with succulent duck and other parts were dry. I liked the noodles; they were the same flat, wide rice noodles used for chow foon. Overall, $26 just seemed overpriced for what we got. The service was amazingly proficient at handling such a large group; orders were taken, food came quickly, and waters refilled without asking. The restaurant opens at 5:30pm and by 5:15pm, there were two long lines. One was for those who made reservations and the other was filled with diners hoping to get in. Needless to say, I strongly recommend making a reservation. There many dishes I wish I got to try (such as the garlic prawns), but I'll be back in Vegas in 2019. I am sure LoS will still be there.